Dezeen podcasts: in our latest podcast for the Design Museum, representatives from Sao Paulo, Bangalore, Beijing and Moscow discuss the nature of design cities and debate the next city to take the title. Architect Ruy Ohtake discusses the density, culture and modernist tradition of Sao Paulo; Professor M P Ranjan of the National Institute of Design, India, asserts that Bangalore's democratic and participative attitude to design will lead its global development; editor and graphic designer Ou Ning puts forward Beijing as the next design city; and designer, journalist and teacher Denis Cherdantsev explains why Moscow is ready to inspire. Organised by the British Council and Design Museum, and chaired by the museum's director Deyan Sudjic, the debate took place in London last month as part of an events program surrounding the exhibition Design Cities, curated by Sudjic. Listen to our previous podcast about the exhibition here. 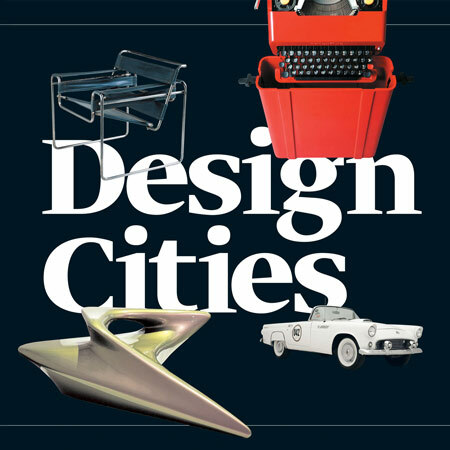 The British Council and the Design Museum examine the notion of Design Cities and find out where this title might be applied in the future. Acclaimed architect Ruy Ohtake argues for Brazil’s largest city, Sao Paulo, with its vibrant design scene and host of landmark buildings and structures. Professor M P Ranjan designer and a member of the Faculty at the National Institute of Design, Ahmedabad, will argue in favour of Bangalore, the fastest growing metropolis in India. Ou Ning prominent editor and graphic designer will put forward the case for rapidly developing Beijing. Denis Cherdantsev is a designer, journalist and teacher who will make the case for the largest city in Europe - Moscow. At the end of the event the audience will be able to cast their vote in response to the arguments and campaigning of the night. Professor M P Ranjan is a designer and a member of the Faculty at the National Institute of Design, Ahmedabad (NID), India. NID is India's premier design Institute, set up in 1961 by the Government of India. Prof M P Ranjan has been teaching at NID since 1976 and over the years at NID he has been involved in many different activities: he has created numerous courses and written many papers and books that spread the message of design across different fields of application. He believes that design is a very powerful tool, which will influence change in as many as 230 sectors of the Indian economy if it is used at appropriate stages to address real needs in all these sectors. Brazilian architect Ruy Ohtake is known for his dynamic and unusual architectural designs. Some fine examples of his work include the half-moon-shaped Hotel Unique (considered by architecture pundit Paul Goldberger to be one of the seven wonders of the modern world), the Hotel Renaissance building, and commercial building Edifício Santa Catarina at Avenida Paulista - all three located in the city of São Paulo. Ohtake is also famous for the design of the Cultural Institute Thomie Ohtake and the commercial building next to it. As an editor and graphic designer, Ou Ning is perhaps best known for his seminal book New Sound of Beijing (1999), which helped define the capital’s emerging rock scene. As a curator, he initiated the Get It Louder exhibition which tours in the major cities of China every two years. He is also the commissioned curator of the sound art section in China Power Station. As an artist, Ou is known for his involvement in urban research and his archive and documentation projects. He is also a frequent contributor of various magazines, books and exhibition catalogues and has lectured around the world. In November, 2008, Ou was appointed the chief curator of the 2009 Shenzhen Biennale of Urbanism and Architecture. He is currently based in Beijing, and is the Director of Shao Foundation. Denis Cherdantsev is a designer, journalist and teacher of design. He works for Designet, Russia’s leading web site for the promotion of Russian design, focussed on supporting the national design community. His work includes focusing a network of Russia’s leading designers, architects, studios and related companies; he has also worked on the development of a number of exhibitions, including an international show for Sollers, a Russian car manufacturer; and he is a teacher at the British Higher School of Arts and Design. Denis’s journalistic work is mainly for Designet, however, he has also written for numerous design publications.